Bill Mayall was born in 1948 in New York. After completing his bachelor's degree at the University of Houston, Texas, he entered Officer Training School in August 1970, and was commissioned a 2d Lt in the U.S. Air Force at Lackland AFB, Texas, on November 18, 1970. Lt Mayall next completed Undergraduate Navigator Training and was awarded his navigator wings at Mather AFB, California, in September 1971, followed by Navigator-Bombardier training at Mather from September 1971 to March 1972. After attending B-52 Stratofortress Combat Crew Training, Lt Mayall served as a B-52 navigator-bombardier with the 7th Bomb Wing at Carswell AFB, Texas, from September to November 1972, and then deployed to U-Tapao Royal Thai AFB, Thailand, from November 1972 until he was forced to eject over North Vietnam and was taken as a Prisoner of War on December 22, 1972. After spending 98 days in captivity, Lt Mayall was released during Operation Homecoming on March 29, 1973. He was briefly hospitalized to recover from his injuries, and then attended FB-111A Combat Crew Training from July 1973 to March 1974. His next assignment was as an FB-111 Weapon Systems Officer (WSO) with the 715th Bomb Squadron of the 509th Bomb Wing at Pease AFB, New Hampshire from March 1974 to November 1977, followed by service as a SAC FB-111 Bombing and Navigation Officer in the Directorate of Training and as Executive Officer in the Directorate of Conventional Operations and Aircraft Testing with Headquarters Strategic Air Command at Offutt AFB, Nebraska, from November 1977 to March 1981. Maj Mayall then returned to the 715th Bomb Squadron at Pease AFB as an FB-111 Instructor Navigator and Flight Examiner from March 1981 to July 1983, and he then attended Air Command and Staff College at Maxwell AFB, Alabama, from July 1983 to June 1984. His next assignment was as Deputy Director of Operations and Deputy for the B-1B and B-1B Systems Development Officer with Detachment 1, Headquarters Strategic Air Command with duty at Wright-Patterson AFB, Ohio, from June 1984 to January 1986, and then as Special Assistant to the Chairman of the Joint Chiefs of Staff for POW/MIA Affairs, as well as serving as the Chairman, Joint Chiefs of Staff's Advisor on POW/MIA Affairs, at the Pentagon from February 1986 to August 1989. During this time he also served as Special Assistant to the President's Emissary to Vietnam, General Jack Vessey, from February 1987 to August 1989. 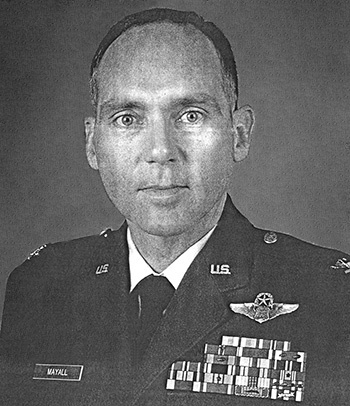 Col Mayall attended National War College from August 1989 to June 1990, and then served on the faculty, served as Chief of Curriculum Development, and then as Dean of the Department of Curriculum Development with the Joint Forces Staff College at Norfolk, Virginia, from July 1990 to June 1993. His next assignment was as Assistant Deputy and then Deputy Chairman of the Department of Strategy at the Industrial College of the Armed Forces (ICAF) at Fort McNair, Washington, D.C., from July 1993 to July 1996, followed by service as Dean and Associate Dean of Faculty and Academic Programs, Joint Chiefs of Staff Chair, with ICAF from July 1996 until his retirement from the Air Force on September 1, 2000. After retiring from the Air Force, Bill served as Executive Director of the ICAF Center for Strategic Leadership Development and as Chairman of the Department of Leadership and Information Strategy from October 2000 to June 2004, as Associate Professor of Behavioral Science at ICAF from July 2004 to July 2006, as Director of Risk Managment Applications with ThoughtQuest LLC from August 2006 to August 2007, as Director of Business Solutions with Computer Sciences Corporation (CSC) from August 2007 to February 2009, as Director of the Knowledge Solutions Group with CSC from February 2009 to November of 2010, and as Chief Knowledge Officer/Director with MicroTech University since November 2010. First Lieutenant William T. Mayall distinguished himself by heroism while participating in aerial flight as a B-52 Navigator over North Vietnam on 21 December 1972. On that date, Lieutenant Mayall participated in high-priority bombing missions against vital military targets in heavily-defended areas of North Vietnam. Despite the extreme hazards presented by surface-to-air missiles and hostile interceptors, Lieutenant Mayall displayed extraordinary courage, a remarkable ability to perform under stress, and a willingness to place the mission requirements above his personal safety in order to successfully release his ordnance on the designated targets. The outstanding heroism and selfless devotion to duty displayed by Lieutenant Mayall reflect great credit upon himself and the United States Air Force.